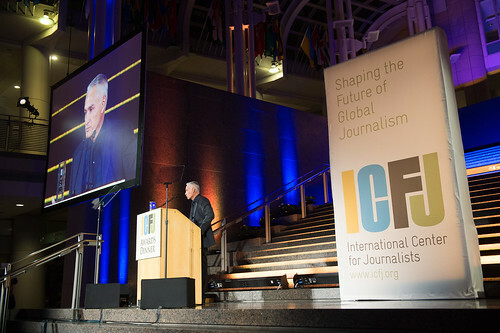 Leading Hispanic broadcaster Jorge Ramos told journalists not to apologize for challenging authority after accepting ICFJ's Founders Award for Excellence in Journalism. "Our place is not to be with the powerful but outside the circle of power," said the Univision anchor and reporter. "Our role is to be the anti-power." Read our story about his remarks. Photojournalist Lynsey Addario, whose images show the human side of conflicts from Afghanistan to South Sudan, said journalists have lost the "shield of security" that once allowed them to enter danger zones. "I do everything I can to work under the radar," said Addario, who received the Award for Excellence in International Reporting. Read more. Journalists from India and Cuba, honored with the Knight International Journalism Award, warned of "dark times" for free expression in their countries. Read our story. Investigative reporter Priyanka Dubey, who has risked her life to expose abuses against women and children in India, said "the space for dissent is continuously shrinking." Watch her tribute video or read her remarks. Yoani Sánchez, a trailblazing Cuban blogger and founder of the country's first independent daily digital news service, said honest reporting is treated as "treason" by Cuba's communist government. Watch her tribute video or read her remarks. Knight Foundation President Alberto Ibargüen announced a $900,000 grant from the Bill & Melinda Gates Foundation for a sweeping program, led by ICFJ Knight Fellows, to promote data-driven investigative reporting that engages audiences on health and development issues in Africa.